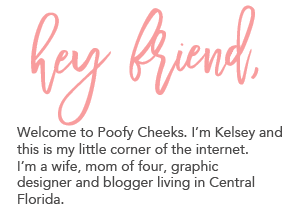 Hey guys – I am sharing a recipe I shared on Tatertots and Jello a while back! I am making and bringing this German Chocolate Cake Trifle to my parents house for Mother’s Day tonight. Since we are going to be on vacation we are celebrating a few days early. I am not a big chocolate person but put the word ‘German’ in front of it, coconut pecan icing ON it and I am THERE! Growing up my grandma would make my dad a homemade German Chocolate Cake (his favorite dessert) for his birthday every year. When we moved to Florida I took on the task of making it since my grandma still lives in Illinois (I’m originally from Rochelle, IL). This is the first year I didn’t make it for his birthday. His birthday is December 21st and the Christmas season was more hectic than usual. I have to admit half the reason I make the cake is because it is my favorite too so with that in mind I still needed my yearly German Chocolate fix! He was over at our house the other day and I asked if he had any ideas for Mother’s Day dessert and he said he had been craving chocolate cake. My dad isn’t a big chocolate person either so this struck me as odd but I knew exactly what I should make! While making a homemade cake isn’t that much more work than a boxed cake mix I had a different idea in mind. 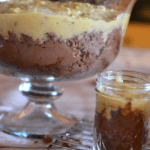 I wanted to make a German Chocolate Trifle by combining elements from my grandma’s German Chocolate Cake recipe and my mom’s famous chocolate trifle recipe. The end result was pure perfection! Bake your cake according to the box directions. Allow cake to cool completely. For the coconut pecan icing beat egg yolks, evaporated milk and vanilla in a medium saucepan. Once mixed add in sugar and butter. Cook the icing mixture on medium heat, stirring constantly until it starts to thicken (about 10 minutes). Remove the icing from the heat and stir in coconut and pecans. Allow icing to cool completely. Make pudding by mixing the box of pudding mix with 1 cup of milk in a medium bowl. Whisk mixture until pudding starts to thicken, about 2 minutes. In a large bowl use your hands to crumble in half of the cake. Layer all of the pudding over the cake using a spatula to spread it around evenly. Layer the rest of the cake and then pour the icing over the top. Refrigerate the trifle up to four hours or overnight. Store covered in the refrigerator. *To keep things rolling I usually make the cake and while it is baking I mix up the icing. When the icing and cake are cool I quickly mix up the pudding and then layer it together. *Instead of layering it in one large bowl you can use mason jars instead. It makes about 20 (8 ounce) jars. This dessert will be a total hit with my family. The pudding and icing keep the cake moist and the addition of the homemade coconut pecan icing make this dessert a homerun. If you are still looking for a special dessert to serve on Mother’s Day or any occasion really – I would add this to your list! It makes enough to feed a crowd so you could even take some into the office and share with your co-workers or friends! I am pretty excited because we haven’t had our whole family together since Thanksgiving and tonight we will all be at my parent’s house. My sister and husband have the night off and my brother just came home for summer break (he goes to FSU) this week. There are always lots of laughs and fun when we get together.